Anton LaVey didn’t care about mystical opposites. For him, Baphomet was synonymous with the Devil, a particular devil—the one he could sell you for a $200 membership fee. Born Howard Levey, he ran away from home to join the circus at age 16. For most of his life, he continued working in circuses and carnivals, but also played piano for burlesque shows. In the early 1960s, LaVey’s minor celebrity status in San Francisco drew a few notable locals to his regular parties. Supposedly, as reported by his Church, from that party scene came The Order of The Trapezoid which met regularly to listen to the showman lecture on philosophy and the occult. After LaVey ritualistically shaved his head and declared 1966 the Age of Satan: Year One, The Order of the Trapezoid become the governing body for The Church of Satan. Whatever his faults, or perhaps because of them, LaVey was a master of marketing and branding. After introducing the world to his church and enjoying several years of media spectacle, including the first Satanic Wedding, LaVey’s next move was to release The Satanic Mass on LP in 1968. 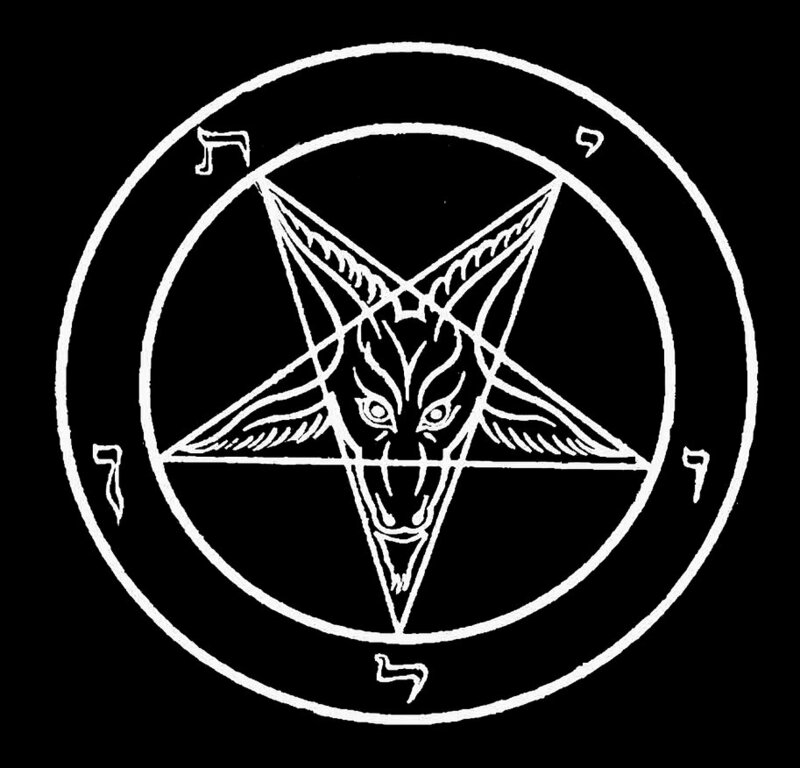 Emblazoned strikingly on the cover was the Church of Satan’s mark, now famously called the Sigil of Baphomet: a goat’s head in the center of an inverted pentagram with mystical symbols at each of its points. 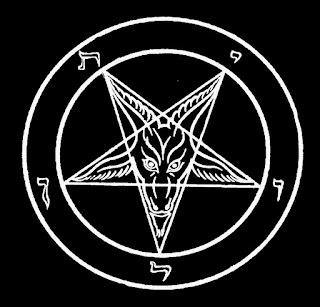 This Sigil would become the official symbol of The Church of Satan, forever tie Baphomet with the Devil of Christianity, and was, of course, lifted from another source. Marquis Stanislas de Guaita was a morphine-addicted poet and a mystic who founded the Kabbalistic Order of the Rose-Cross in Paris. He was also a fan of Eliphas Levi. In 1897, before his death by overdose, de Guaita published a book called La Clef de la Magie Noire (The Key to Black Magic) which included an image based on a description by Eliphas Levi. Several other occultists used de Guaita’s image in their own work, after some tweaks, before Maurice Bessy included the original in his A Pictorial History of Magic and the Supernatural which was published in the 1960s. From that book, LaVey took de Guaita’s image, removed the words “SAMAEL” and “LILITH,” then distorted the Hebrew characters positioned at the star’s points until they looked appropriately more sinister. This was all, of course, supposedly to fully realize the Sigil of his church but more likely had to do with the trademarks he later filed. 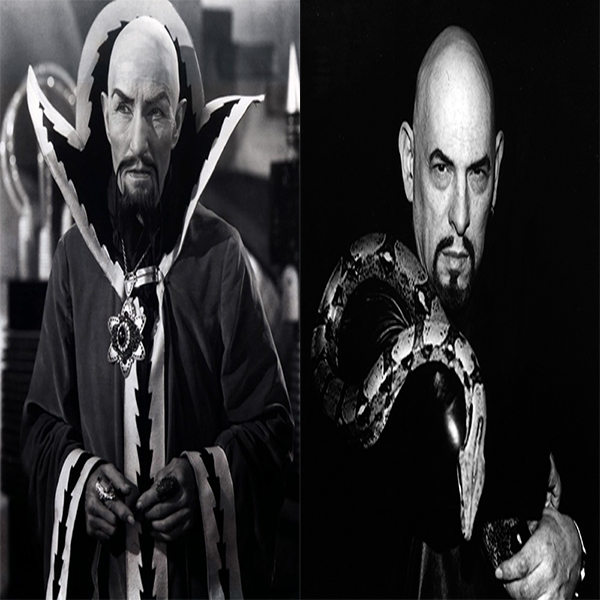 LaVey or Ming the Merciless? LaVey was, of course, no stranger to appropriation. 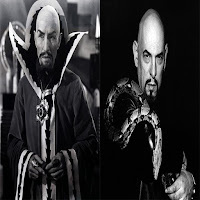 As befits a strident proponent of Social Darwinism, most of his shtick was borrowed: his look was pure Ming the Merciless; his Satanic philosophy was a dash of Nietzsche mixed with Ayn Rand’s Objectivism, then hidden under the hokum of magic and the distraction of naked women holding serpents; while portions of his Satanic Bible are simply cribbed directly from Ragnar Redbeard’s Might is Right. His appropriation claimed Baphomet for the Devil in the popular consciousness. And perhaps the most honest thing he ever did was operate his religion as a business.